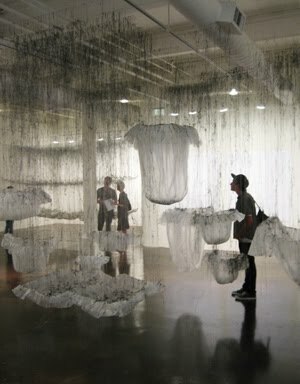 It may be made of only plastic bags, masking tape, and hot glue, but Yasuaki Onishi’s work was well received Thursday night at Kala Art Institute’s Residency Projects Part II. Onishi’s large-scale installations fill much of the open gallery at Kala’s new location and appear to be very at home in the structure. It is worth the trip just to relate to the hair-like tangle of black glue which cannot help but send your mind along strings of analogies – the brain, consciousness, emergentism, and sticky fingers. On the other side of the gallery, the large-scale photographs of Ali Richards are also worth examination, but the pin-up display did prove to be a little distracting in this venue. For a more intimate encounter with her work, this is a good site. The OnView work, scattered throughout the gallery, presents a nice showing this time. One of my pieces can be found in the main archive, although for more recent work, I would urge you to visit the gallery at Oakland International Airport’s Kala exhibition, or the Kensington library, starting on September 2nd. 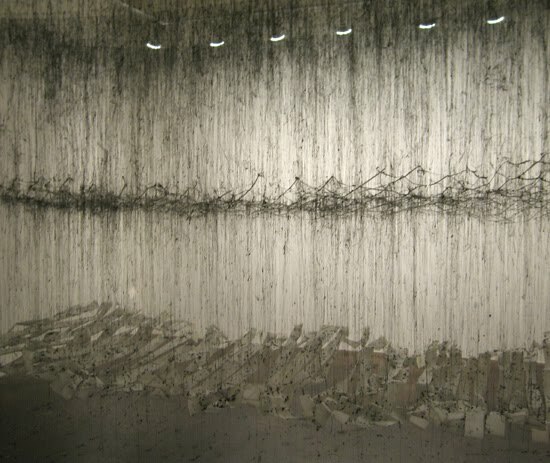 This entry was posted in Events, Kala Art Institute, Openings on August 29, 2009 by ellenheck. The Hearst Art Gallery at St. Mary’s College is currently exhibiting California in Relief: A History in Wood and Linocut Prints, which we were able to visit this weekend. The relief prints are displayed chronologically (mostly…there are some confusing corners) and begin in the late 19th century with some beautiful woodcuts with eastern influences. 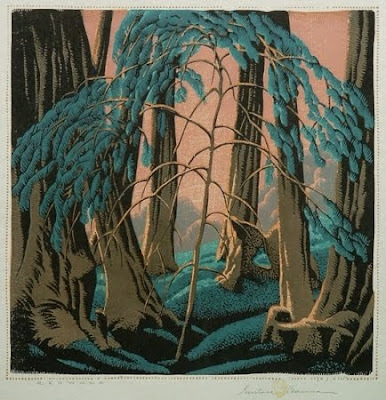 There is a Gustave Baumann print, Redwoods. It’s not my favorite of his, but fun to see the oatmeal paper and heart-in-the-hand up close. 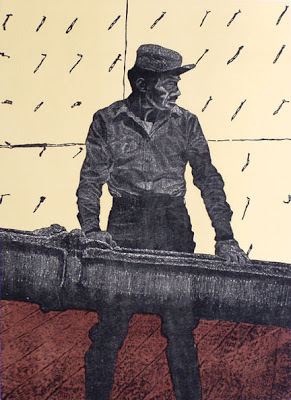 My favorite by far was a Linda Lee Boyd print, Pouring Concrete III which is an ode to everything that the woodcut can provide – the fine grain on the man’s face and shirt lifted subtly with an electric engraver set against the stark flatness of a thickly inked brayer. The curators also did an excellent job with the wall colors; deep, rich hues behind the large black and white woodcuts from the 60s enlivened what could have been a very bland experience. This entry was posted in Art Friends, Events, From the World, Museums on August 20, 2009 by ellenheck. Newly off the press: Karla and Zoe, inspired by Cassatt’s Mother’s Kiss and Maternal Caress. Many thanks to Susan Kemner-Reed and her family for the extensive reference work. Mrs. Kemner-Reed is currently at the Art Institute of Chicago pursuing her own work with a TICA grant. She shows at Wally Workman gallery in Austin, Texas. This entry was posted in From the Studio, New Work on August 1, 2009 by ellenheck.